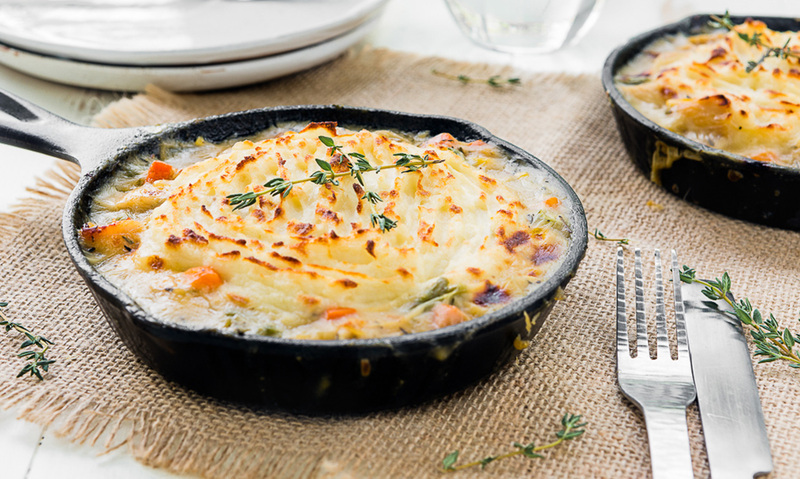 A delicious combination of a pot pie and Shepherd’s Pie. This Chicken Shepherd’s Pot Pies, topped with our White Cheddar Mashed Potatoes, are sure to be a new family favorite recipe! Melt the butter in a medium-sized pot over medium heat. Add the onion and thyme; cook until translucent, about 5 minutes. Add the flour and cook for 2-3 minutes, stirring constantly. Add milk and the chicken broth, and mix until completely incorporated and there are no lumps. Add the chicken and mixed veggies and stir to combine. Test the seasoning and adjust to taste. Remove from heat and set aside. Divide the chicken and vegetable mixture into 4 individual baking dishes or mini skillets. Spread Bob Evans White Cheddar Mashed over the filling; use a fork to make peaks, is desired. Bake for 10 to 15 minutes, or until the potatoes are lightly browned and the turkey filling is bubbly around the edges. 2 Melt the butter in a medium-sized pot over medium heat. Add the onion and thyme; cook until translucent, about 5 minutes. 3 Add the flour and cook for 2-3 minutes, stirring constantly. Add milk and the chicken broth, and mix until completely incorporated and there are no lumps. 4 Add the chicken and mixed veggies and stir to combine. Test the seasoning and adjust to taste. Remove from heat and set aside. 5 Divide the chicken and vegetable mixture into 4 individual baking dishes or mini skillets. 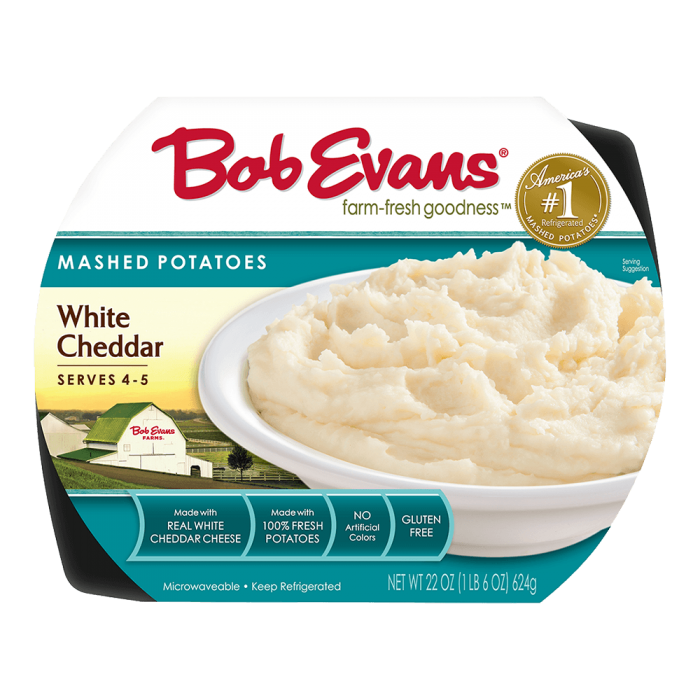 Spread Bob Evans White Cheddar Mashed over the filling; use a fork to make peaks, is desired. 6 Bake for 10 to 15 minutes, or until the potatoes are lightly browned and the turkey filling is bubbly around the edges.